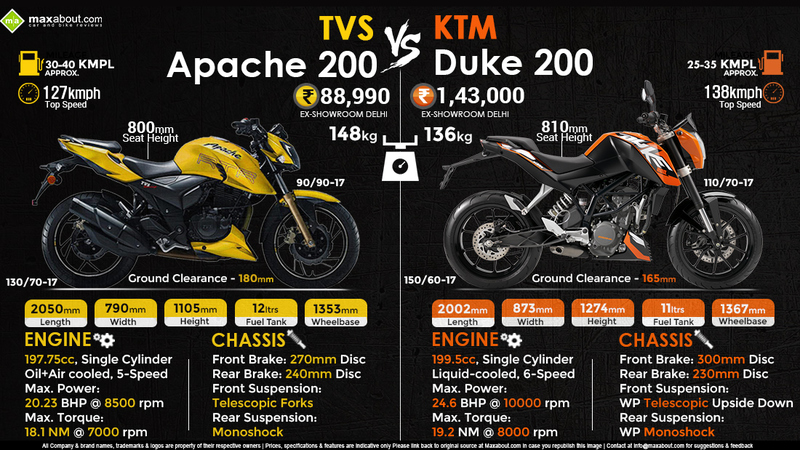 TVS Apache RTR 200 holds the title for the most value for money 200cc motorcycle in the country while KTM 200 Duke even stays ahead with its title of being the most powerful 200cc motorcycle of India. Both of them are completely different from each other, carrying just the simple notion of being within the same category. Here you can see the differences between them in a detailed manner. KTM 200 Duke is expensive for an average India, costing above INR 1.60 lakh (on-road price). Although carrying a 199.5 cc engine, it even brings fuel injection and liquid cooling into the game. All of the focus goes into its lightweight manufacturing, claiming a weight of just 136 kg for the 200 Duke. That is even less than many 150cc sportbikes of the country. It produces 24.6 BHP and 19.2 Nm of torque while using premium components like USD forks and wider tyres. The 6-speed transmission here is silky smooth and very responsive. The instrument console and Pirelli tyres of the Apache 200 are those things which could turn you to the other side. TVS Apache RTR 200 is currently available with just carburetor fed, oil cooled 197.75cc engine producing 20.23 BHP and 18.1 Nm of torque. It weighs 12 kgs more than the 200 Duke and uses a 5-speed gearbox instead. This makes it 11 kph slower when compared to the 138 kmph top speed of the 200 Duke. On the other side, it is lighter on your pocket, saving around INR 60,000 when compared in terms of on-road prices. KTM 200 Duke is definitely for those who are more into performance and least bothered about budget while TVS Apache RTR 200 is the best bike for those who are looking for a part time thriller and a full time everyday bike.